Gingival hyperplasia has been defined as enlargement of the gingiva due to an increase in the number of cells and hypertrophy as enlargement due to an increase in the size of the cells. Gingival hyperplasia secondary to periodontal disease is frequently seen in patients with unattended oral pathology with no professional care and minimal home care. 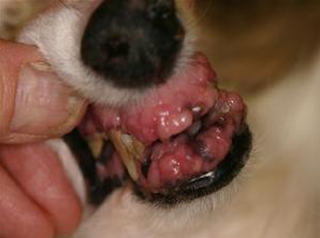 Enlargement of the gingiva is common in Boxers, Great Danes, Collies, and Dalmations and is thought to be a familial trait. Drug reactions can also cause gingival hypertrophy. It is very important to keep an exact list of all medicines being used if consulting with an animal dentist because of overgrowth of the gingival tissues. Your worst nightmare now becomes Dr. DeForge’s privilege to treat and return to a quality-pain free life. For years the fracture of the mandible was treated with internal fixation plates and lag screws. 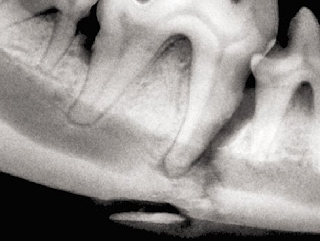 The problems with these techniques centers on damage to the dentition or potential nerve damage upon application Many animal orthopedists still utilize these techniques when animal dentists are not available for consultation. Fixation failure can lead to infection; malunion; or non-union. Fixation instability results in inaccurate reduction. Consider a Root Canal before tooth extraction! The Root Canal-A Non-Invasive-Non-Painful Treatment! Forget the unnecessary extraction of the past! 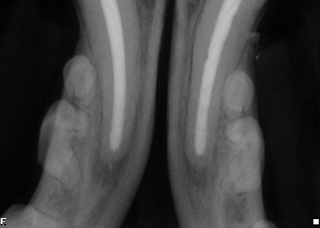 A radiograph is an essential first step, to evaluate the bone and confirm that the root is intact. There are two options for dealing with a fractured tooth that has exposed the pulp chamber. Ignoring the problem is nota good choice. Option #1 is root canal and Option #2 is extraction. Never extract a tooth without FIRST offering root canal treatment. Never extract a tooth if the root canal is refused without pre-and post dental x-rays. 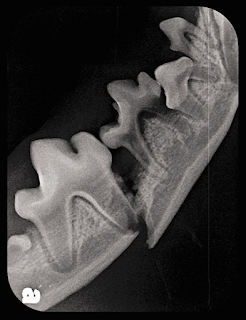 The Mandibular Iatrogenic Fracture Why call upon Dr. DeForge to help with the Periodontal Care of Geriatric Dogs? Iatrogenic fractures are common when attempting to remove the distal mandibular molars and the mandibular canine teeth. With 20 years of experience as an animal dentist, Dr. DeForge utilizing human oral surgery techniques can easily remove these teeth without any trauma to the manidble. Many of these patients present with pathoogical fractures that are not visible without pre-treatment oral radiology. Apathologic fractureis a bonefracturecaused by disease that led to weakness of the bone structure. This process is most commonly due to advanced periodontal disease but can also be related to bone cancer, infection, inherited bone disorders, or bone cysts.